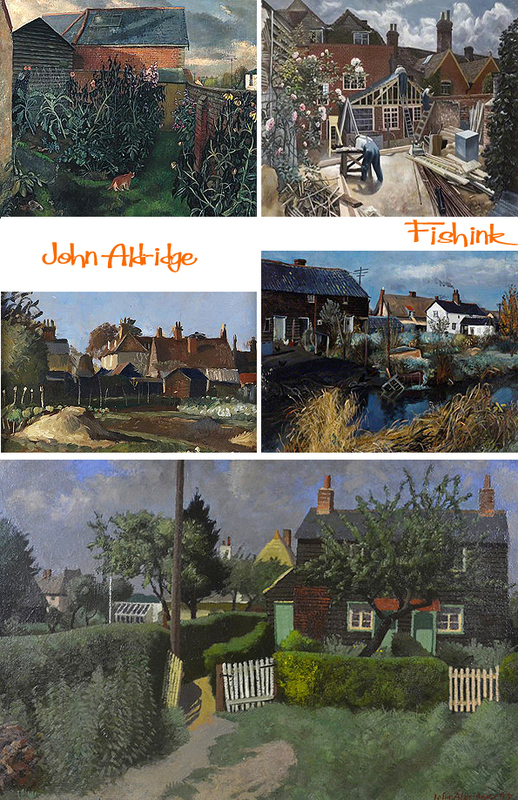 John Aldridge was born in 1905 in Woolwich, England, and grew up in a comparatively wealthy military family. After attending Uppingham School in Rutland, he studied ‘Greats’ at Corpus Christi College at Oxford University and graduated in 1928 with a Bachelor of Arts degree. 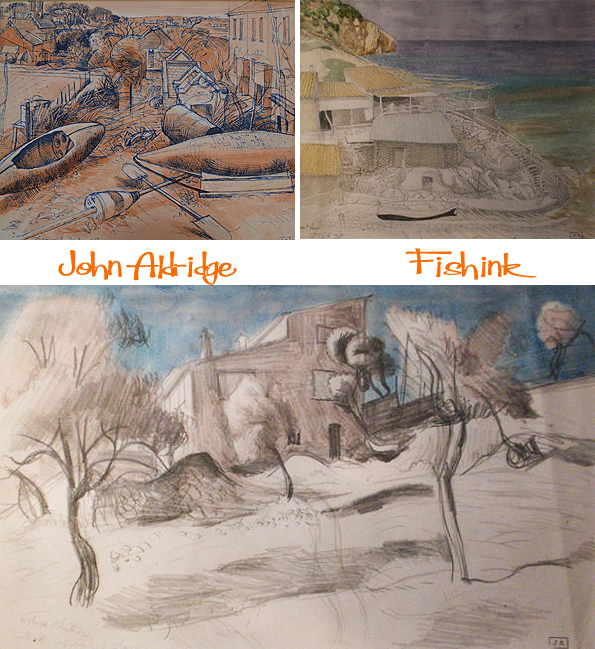 After finishing university, John settled in London, taught himself to paint and held his first mixed exhibition in 1931. 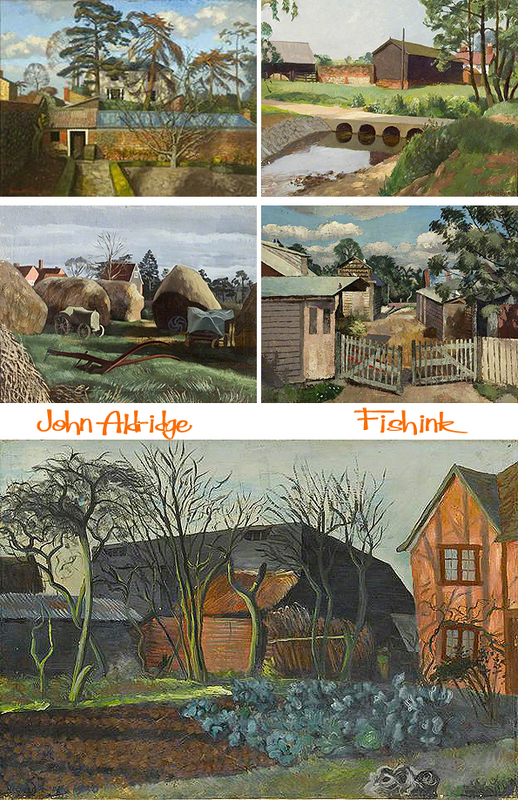 Aldridge exhibited with the ‘Seven and Five Society’ at the Leicester Galleries from 1931 to 1933. In 1933, he presented his first one man-show at the Leicester Galleries in London and in 1934 he exhibited at the Venice Biennale art exhibition in Italy. During this period and for the rest of his life, Aldridge associated with the British poet Robert Graves and the poets and artists centred on him in the village of Deià, Mallorca. In 1933, at age 28, Aldridge, and his cats, moved to Great Bardfield in the Essex countryside and acquired ‘Place House’. He quickly became a friend of his neighbour, Edward Bawden, himself a painter. Bawden who, with his friend Eric Ravilious, discovered Bardfield a year before the arrival of Aldridge and dominated the scene there for almost four decades. 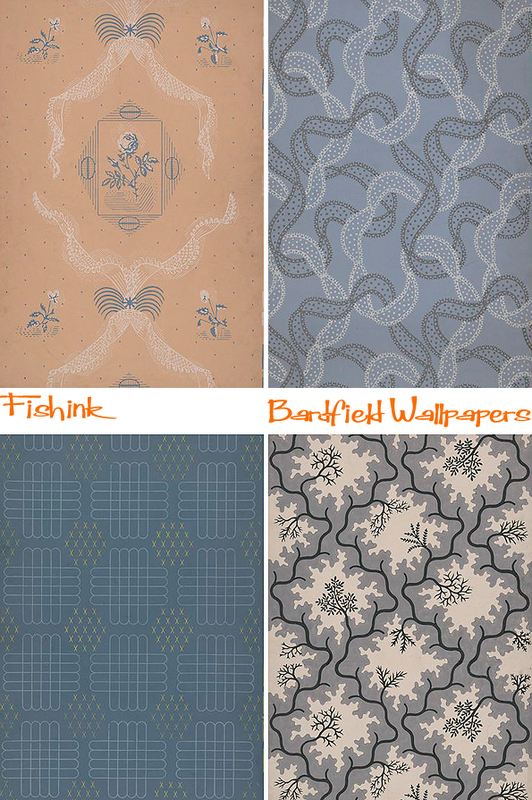 Bawden and Aldridge collaborated in designing ‘Bardfield’ wallpapers during the later 1930s, which were distributed by Cole & Sons, a British wallpaper company, (some examples below discovered on the V&A Collection site). In 1941, Aldridge joined the British Intelligence Corps as an officer interpreting aerial photographs. 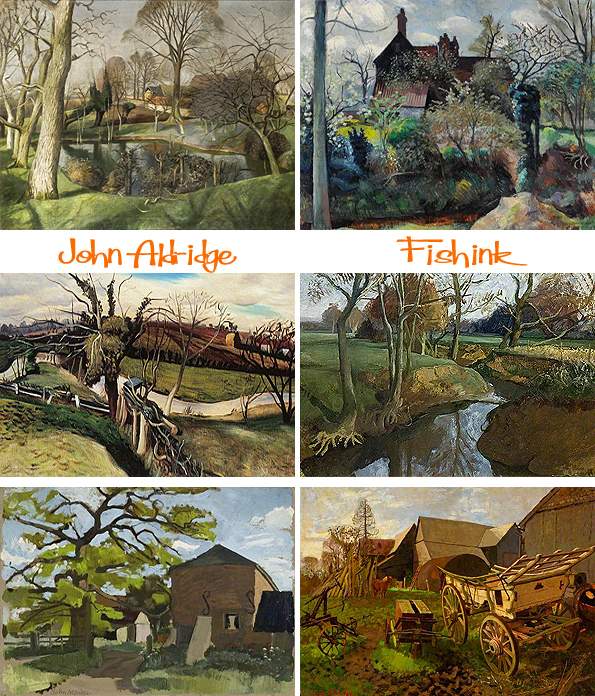 After leaving the army in 1945, Aldridge returned to landscape painting. Although he was a skilled ‘plein air’ painter, many works were produced in his studio at his home; his subjects were the Essex countryside, scenes from his many visits to Italy and to Mallorca, and his much-loved garden at Place House. Starting in 1949, Aldridge taught at the Slade School for Fine Arts of University College London, under the realist painter Sir William Coldstream. 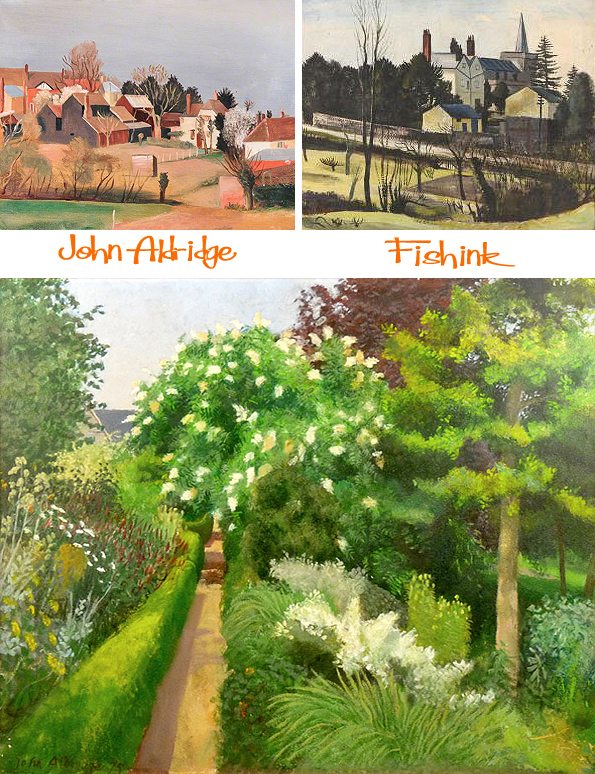 At the same time, other artists started moving to Great Bardfield, making the village a dynamic centre for the visual arts. Aldridge and his wife Lucie Aldridge (née Brown) frequently opened Place House for summer exhibitions in the village. These well-organised shows attracted thousands of art lovers. In 1955, Aldridge told an London Observer reporter that “people seem to prefer this domestic informality to galleries”. 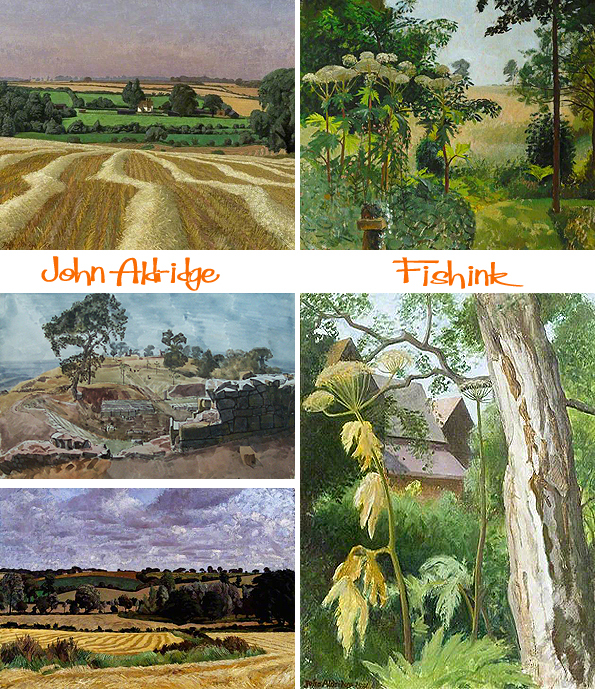 At these summer exhibitions, Aldridge exhibited his oils while Lucy exhibited her hand-knitted rugs. 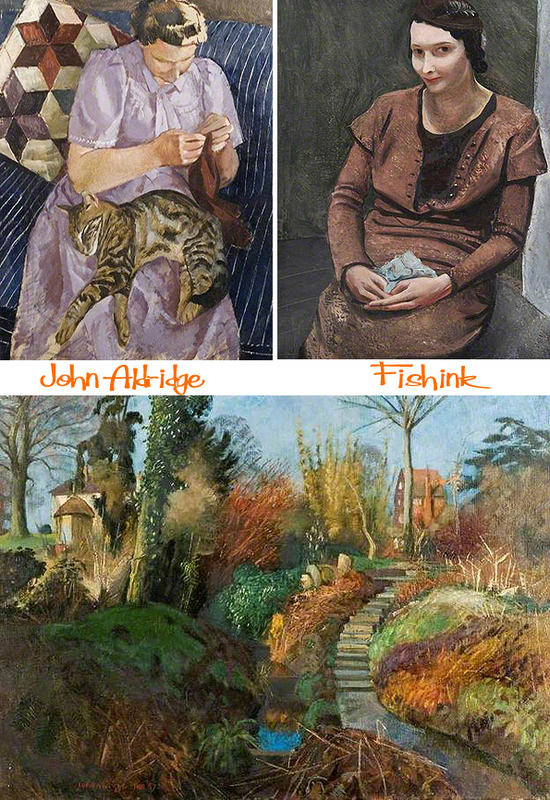 Although Aldridge’s work was well-received, it seemed the most conservative of the Great Bardfield Artists as it possibly reflected the art scene of the 1920s and 1930s in Britain. 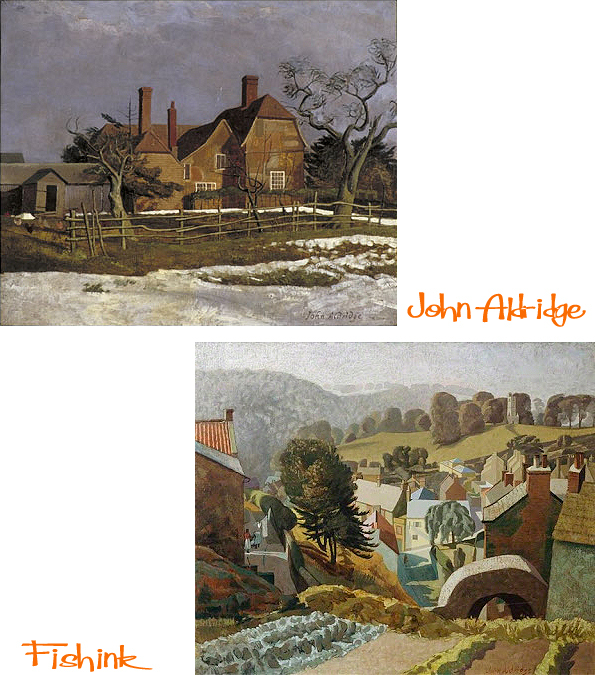 The early 1960s saw the Bardfield art community fragment but Aldridge would remain in Place House until his death. After his 1970 divorce, Aldridge married Gretl Cameron, the widow of his poet friend Norman Cameron. In 1980, on Aldridge’s 75th birthday, London’s New Grafton Gallery held a retrospective on his work. He died in 1983, his wife Gretl having deceased a few months earlier. What a talented artist. What do you like about his work ? 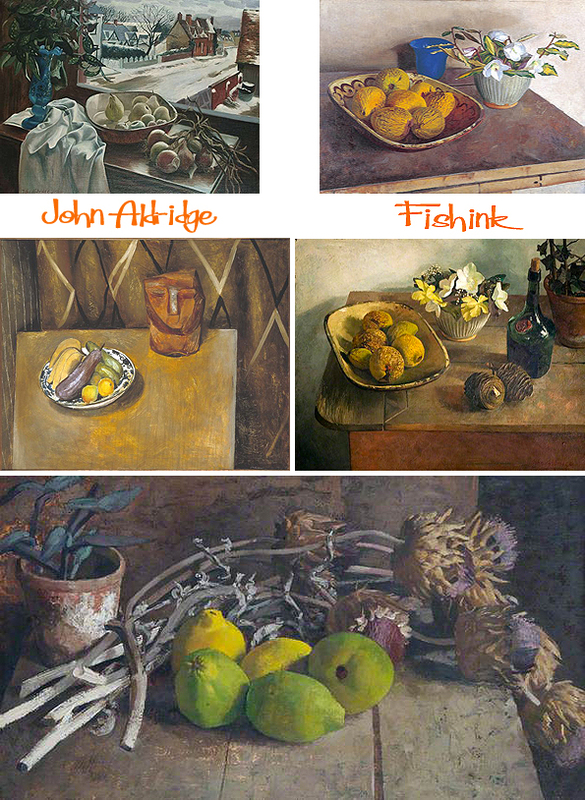 Wonderful paintings, which I hadn’t seen before. I like how the landscapes reflect messy, jumbled-reality – they’re not sanitised at all. Lovely stuff! Great observation Rachel. I also like the fact that his paintings reflect true nature. Thanks for your comment. 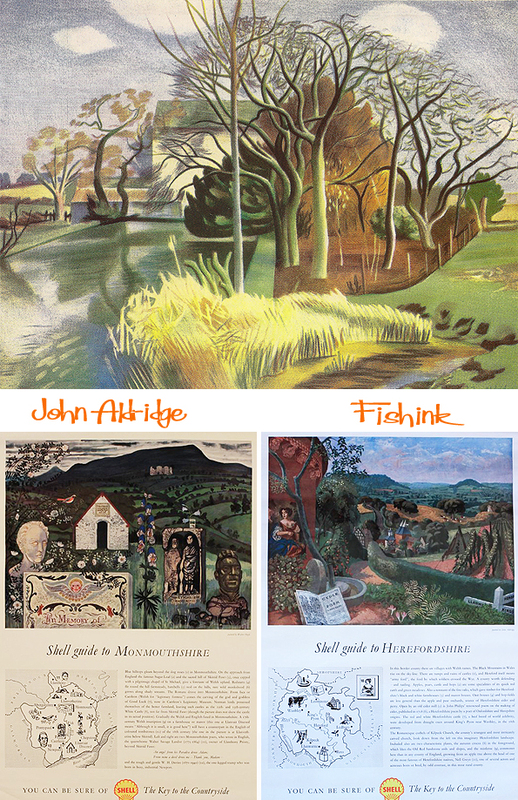 I hadn’t come across Aldridge before, despite being a big fan of Ravilious & Bawden – thanks for the intro to these lovely paintings! Am going to share on my FB page: https://www.facebook.com/pages/Secondary-Modern/292873664191175. Thanks also for your blog; there’s always something interesting here! 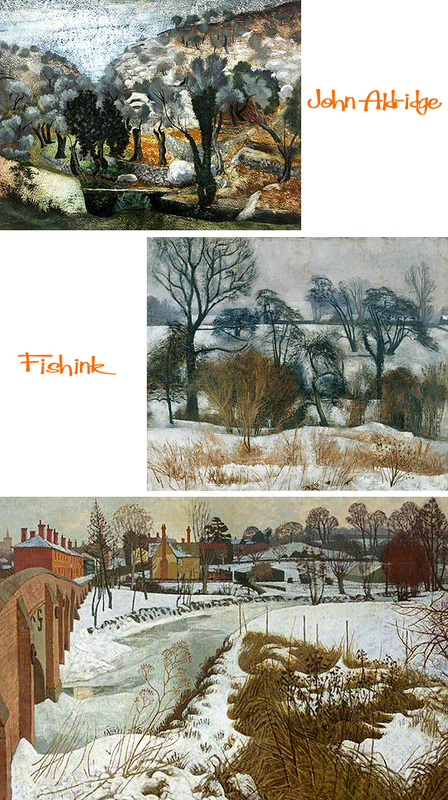 His work depicting stability and country life is like a safety net, a reassurance in a worrying world. Nostalgia for things past. But also a little push to the mind, an encouragement to explore and try again, and not to be too parochial. Thanks for collecting all these fascinating images. I like the (for the most part) subdued, moody colors, and I had the thought that his work represents an impressionist/realist style–if there is such an animal. I like the painting of the carpenters working on a house–somewhat realistic, yet all smudged and soft like Impressionism. and whoa… the woman sewing… holy shades of Mary Cassatt’s ‘Young Woman Sewing In a Garden’! Just toss a cat on her lap and it would be ‘good to go’! I love his palette. His slate blue is so rich as is his deep rust. Incredible, deft use if color and juxtaposing forms;some so fluid and some very geometric. Beautiful work. Thank you so much. I am a painter and is always great to find a new favorite painter. I would love to see his work in person. Have you seen it in person? Hi Jennifer, thanks for your expressive comments. 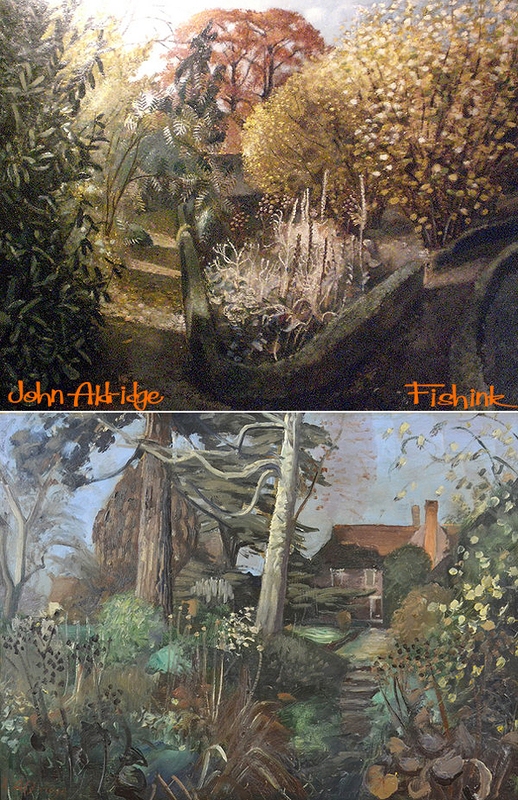 John’s work is wonderfully rich and textural, sadly I haven’t had a chance to view it personally , although it would make a great option for a retrospective exhibition like the Ravilious one a couple of years ago. I would certainly go. Hope your own work is going well.